It all started one day in the fall of 2011 when I lost my cell phone while jogging with my daughter at Sequiota Park in Springfield Missouri. Imagine my surprise when I found it again, lying on my own doorstep, two days later. Incredibly, my cell phone camera contained five new photos, photos that appeared to show some kind of ape-like creature’s progressing attempts at taking a portrait of itself! It was then that I began my study of Springfield's most famous cryptid, the “Legend of Galloway Creek”, the Elusive Urban Skunk Ape. Before the settling of Springfield in the early 1800s, the land consisted of a Karst type of geology, rich with caves and springs, where the forests of the Ozarks Plateau met the Western Plains. 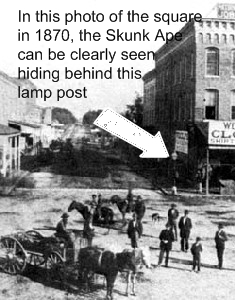 It was here that early homesteaders planted a growing community, yet it appears that, unbeknownst to most, an ancient resident stayed among them – an ape-like creature known for its unusual odor and skunk-like stripe. The creature is believed to have originally resided within the largest cave at Sequiota Spring, making occasional evening trips into town. It appears to have moved out of the main cave by the time Sequiota became a trout hatchery in 1921. Because of its relatively small size and quiet nature it has been able to thrive in its current urban environment, from the subterranean tunnels under the square to the dense woods of Springfield's Greenways. Not at all afraid of humans, it appears to have comfortably lived among us for many years, harming no one, going mostly unnoticed by the busy citizens of Springfield. We invite you to join us in our pursuit of this fascinating creature. Appearance: single individual, apparently male, covered in black fur with white stripe and white top knot on head, almost always wearing pants. A: Yes, we are quite serious about our belief that families can have fun together exploring our urban and suburban environment. Q: Are you sure you're serious? This all smells a little funny to me. A: Yes, the Skunk Ape does smell a little funny. Q: I've done some research, and I'm noticing that a lot of your information is absolutely accurate and some of the events you describe really did happen. Now I'm starting to get worried - Is this stuff REALLY real? A: As we have stated, all our facts are at least 90% true, but don't panic. Take a deep breath, calm down, and read the blog profile again. No creature described in this blog will harm you! Q: Is the Skunk Ape some kind of “missing link”? A: Yes, he is the missing link between skunks and apes. Q: If I happen to see the Skunk Ape what should I do? 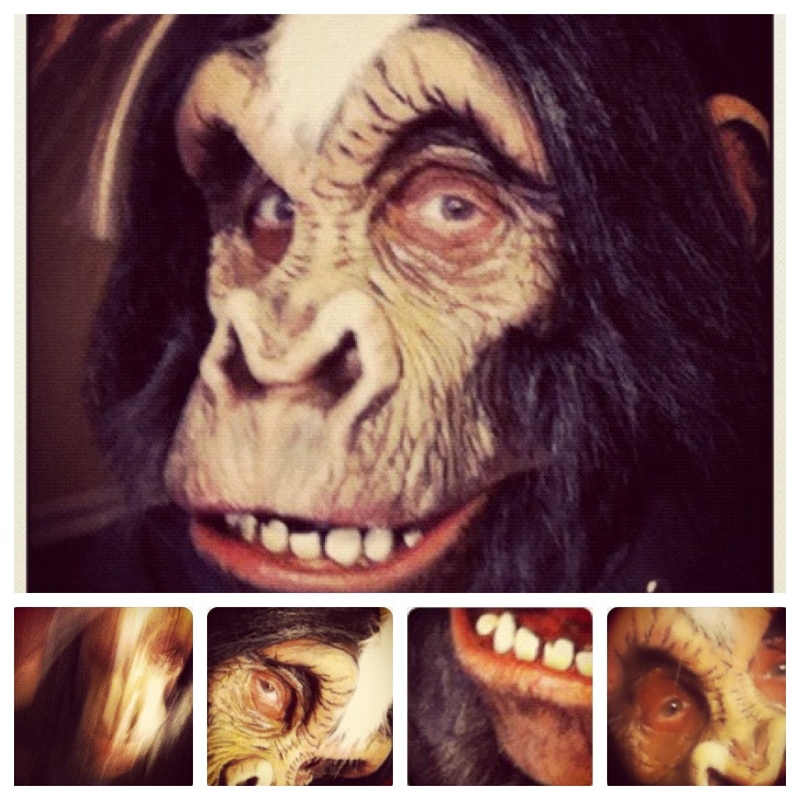 Skunk Ape, Skunk Ape, what ya gonna do?